In this best things to do in Luang Prabang post, you’re about to get first-hand tips on some of the top attractions and especially local food to eat, in one full action packed do-it-yourself-day-tour of the city. Luang Prabang is an UNESCO World Heritage City, packed with culture, natural beauty, and delicious food, not to mention an atmosphere that will overwhelm you with relaxation. You’re about to have an ultimate one-day tour of Luang Prabang! Make sure you get a good night sleep (we had a fantastic stay at the budget Apple Guest House, or a great higher end option is Burasari Heritage Luang Prabang), and you’ll need to wake up early to make the most of your day. 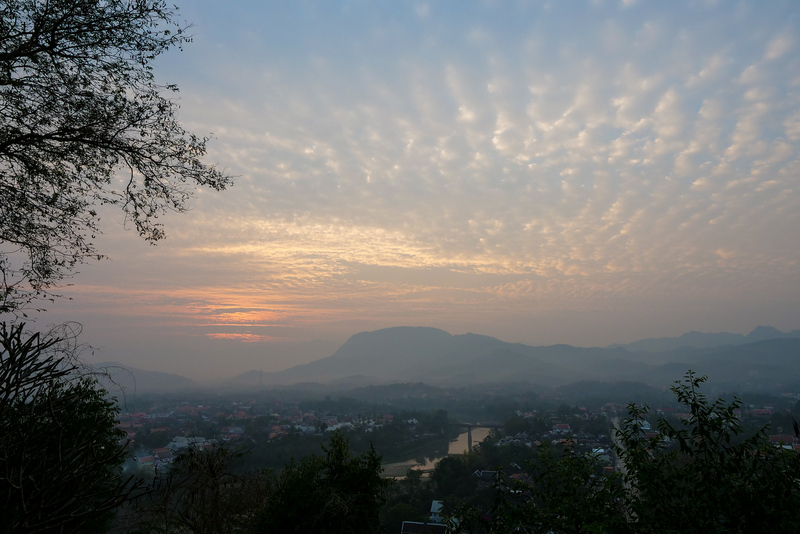 The view of the Luang Prabang sunrise is completely unobstructed when you reach the top of Phou Si Mountain. The climb is all steps, short but steep, with a few switchbacks. This climb will take anywhere from 10-15 minutes, and there’s a small entry fee of 10,000 kip when you reach the temple. Seeing the sun come up – its an immediate payoff to reward your early morning fitness. By the way, we got an insider tip that I’ll pass on to you – don’t climb the main staircase (the one across from the Royal Palace Museum), you will come down that way instead. There are several entrances, and I recommend you start from a staircase next to the Ikon Club (Hungarian owned-small yet popular spot for live music). There are some red brick stairs and a large gap in the wall, find your way through the misty morning air and you’ll have the path to yourself. 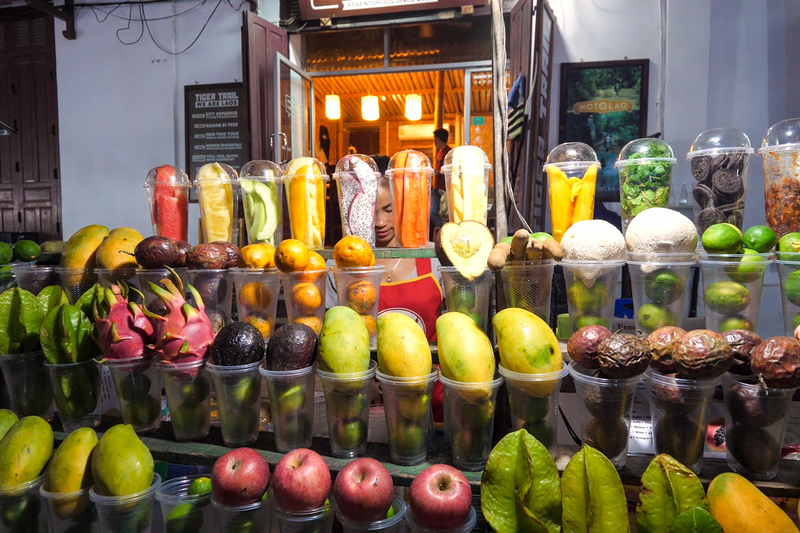 Exploring and snacking through Luang Prabang’s morning market is one of the best things to do in Luang Prabang – something you don’t want to miss. From Phousi Mountain, walk back down the much larger staircase on the NorthWest side (museum side). Take a left when you reach the bottom of the stairs, and you will see the market sellers setting up shop on a small street about 100 meters down the road. This is where your morning market exploration and snacking begins. The morning market in Luang Prabang is much more relaxed and low-key than the morning Khua Din market in Vientiane. For the first time – Grilled Honeycomb with Eggs… Bee Eggs! Enjoy the smiles from vendors as you double take at a few items I can guarantee you’ve not seen for sale on the aisles of any supermarket chain – if you’re lucky it will be the right time of year for traditional grilled honeycomb. The one we had came with the bee’s larvae still inside. Top Recommendation – she makes each Noodle Roll by hand. Walking a bit further, be on the lookout for this wonderful little table under a big canvas umbrella. 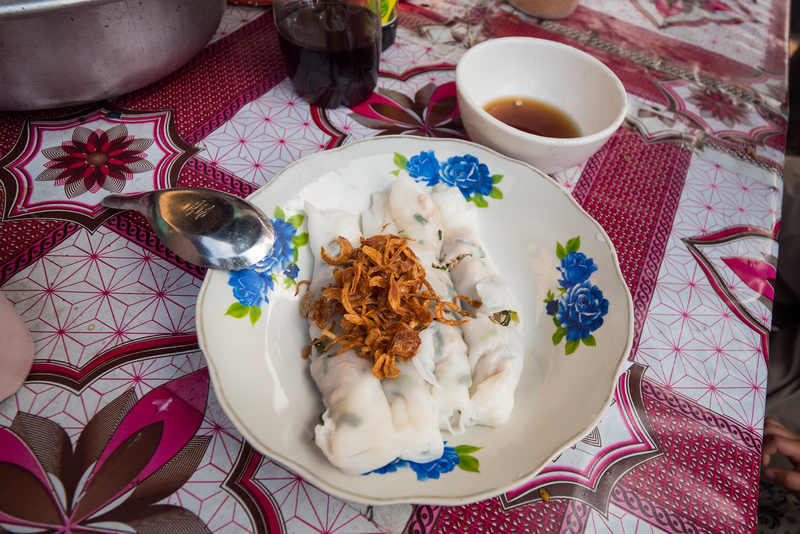 You sit at the chef’s table and watch as she uses her own technique of steaming, rolling, and wrapping at top speed, to make you a plate of hand-rolled noodle pouches, similar to Vietnamese banh cuon. Here’s the small list of snacks we had, but there were just so many more things to try. 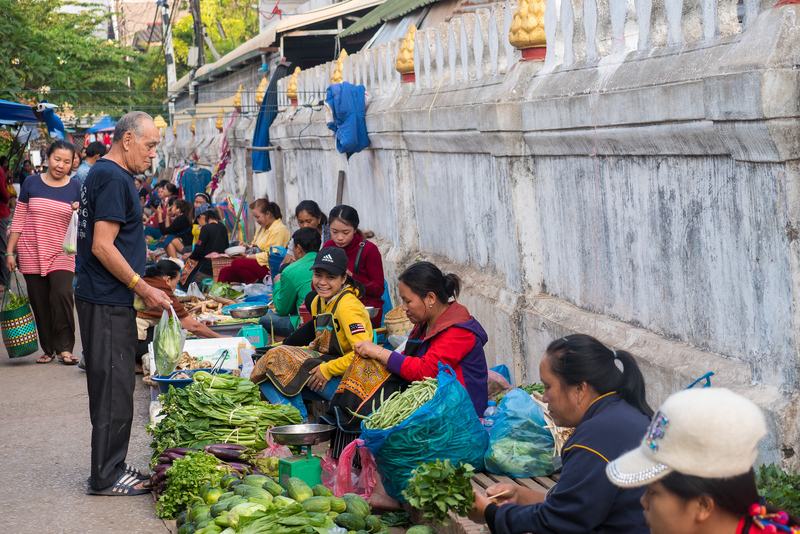 The morning market in Luang Prabang is one of the greatest places in the city to get a feel for the northern Laos culture, and along with delicious snacks, you’ll find an abundance of Lao food ingredients and genuinely friendly vendors. Yes, you would be right to assume that among all the things to do in Luang Prabang, we think eating is a priority. 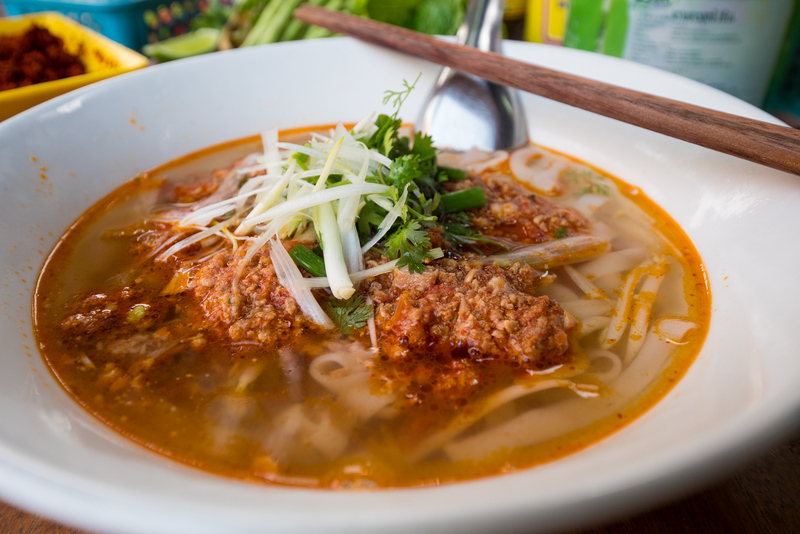 In Luang Prabang, you may have seen Khao Soi on a menu by now (a northern Lao noodle specialty, much different from most versions of khao soi in Thailand), and if you haven’t tried it, then you’re in for a treat. This local family serves each bowl of noodles with care, right from the doorstep of their own home. They open each morning, sell until they’re out, and they have been doing it here for almost 20 years. Their Khao Soi is sensationally good. They’ve maintained quality without having high prices – you can see they just love what they do by the fact that there are only 4 wooden tables for seating. Be sure to make full use of the small mountain of herbs that accompanies each bowl. I asked for seconds on the soup actually, it was so smooth and meaty, perfectly warming in the chilly morning atmosphere. Each bowl of Khao Soi will cost you 20,000 Kip, and I recommend also trying one of the coconut wedges that you see waiting on each table (wrapped in a banana leaf, or already arranged on a plate). To get there: Walk East down the main street several blocks and pass the area where the monks will collect alms each morning (this area is blocked off until 7am, you will notice this intersection as it is right next to the ‘secret’ entrance to the Phou Si Temple climb). Continue a few blocks, the street is much more quiet, you will see the Wat Sene Temple on your left, and khao soi breakfast on your right. Most of the activities in this one day in Luang Prabang itinerary are included in this video. Press play to watch it now, or watch it on YouTube here. Entrance to the entire courtyard is 20,000 LAK per person. 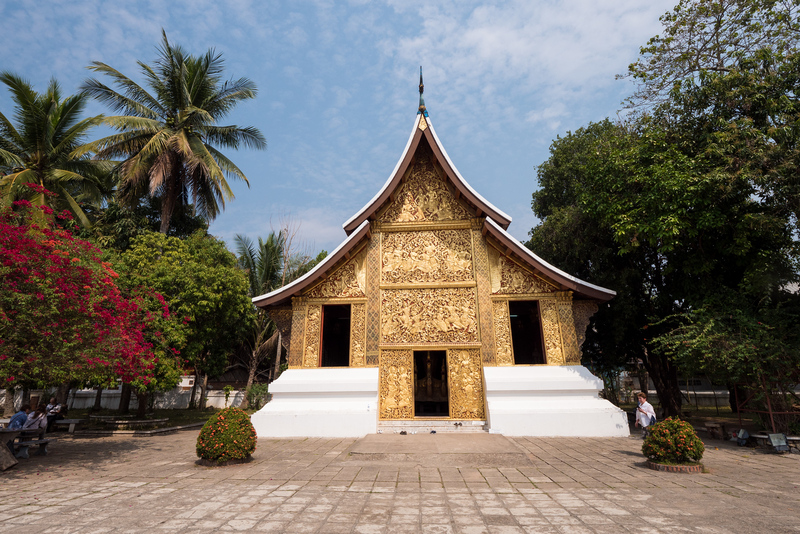 Read any Luang Prabang travel guide, and they’ll recommend visiting so many temples – and it’s true – on the small peninsula there’s a high density of temples. Wat Xieng Thong is a group of temple buildings all decorated differently with a variety of purposes. Full of history, vibrant and artistic, it is worth spending an hour or two exploring this large courtyard full of Laos’ religious culture. Walk around, take your time experiencing the serenity that is the lifeblood of Luang Prabang. 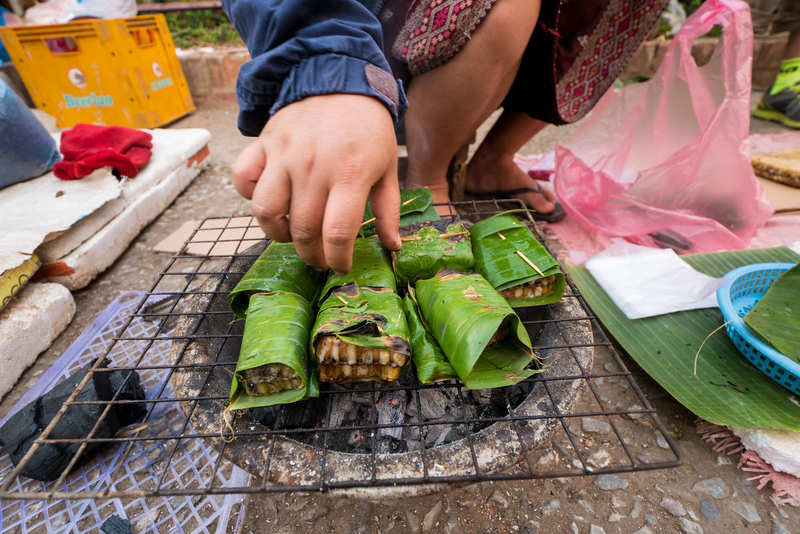 Learn about the traditions of Laos while the treats from this morning have time to digest. Be ready with renewed energy for the next round of deliciousness. Another temple you can visit, directly opposite from the Khao Soi restaurant is the large Wat Sene temple. Just about every street in this wonderful country will have at least one stand selling either Som Tam, Laos-style sausages, or both. Everywhere we went, people were telling us how both dishes “are even better in Luang Prabang!” I have to admit, they were totally right. So now its time for some Tam Mak Hoong (Lao green papaya salad). 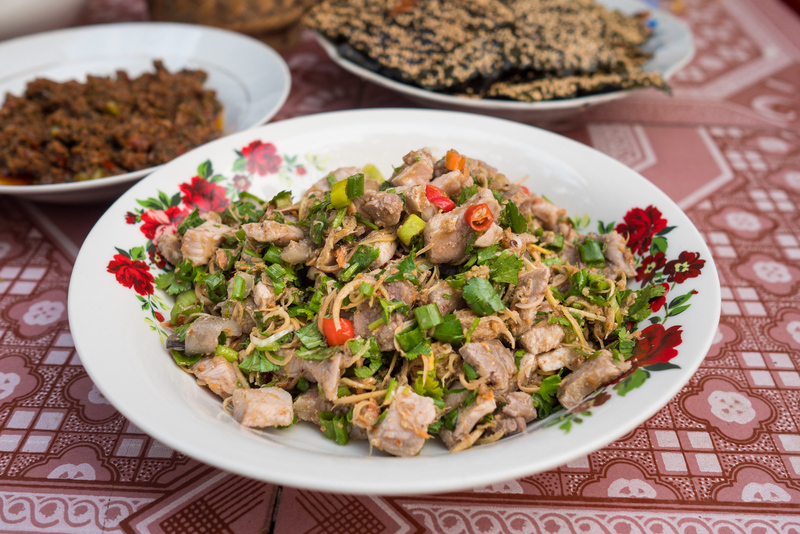 It’s what just about every local Laos person will be having for lunch, so there is no shortage of options. We found a great spot under an awning just down the road from L’Elephant French-Laos Restaurant (a great French restaurant, that additionally offers Vegan food in Luang Prabang). The restaurant goes by the name on the sign “Green Papaya Salad,” and they offer indoor seating, and street seating under the abandoned awning of the building next door. 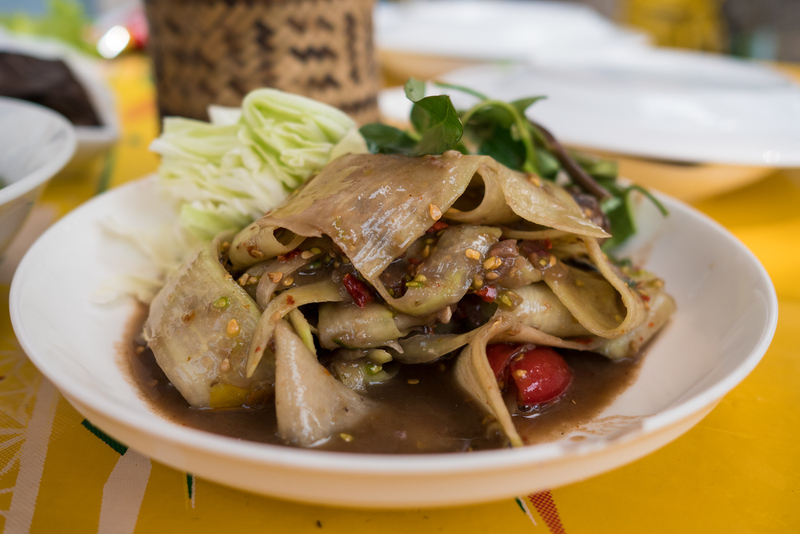 The green papaya salad is always a spicy (and therefore cooling), light meal during a day of walking. 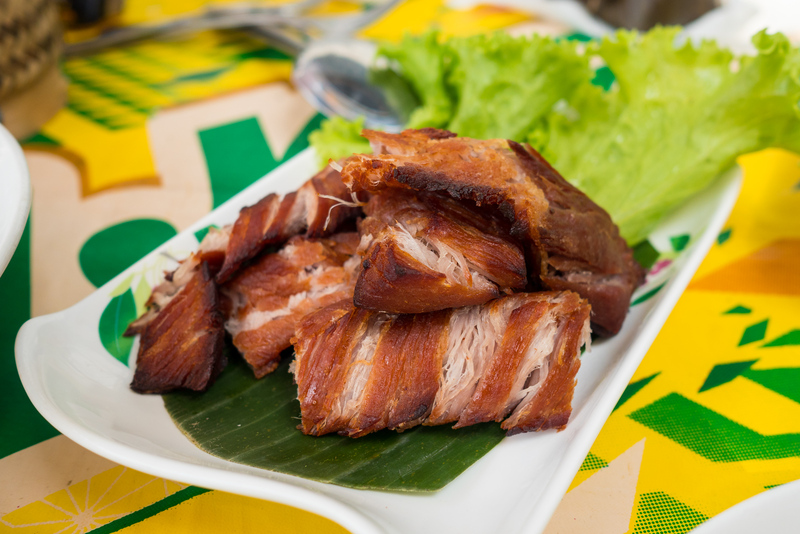 In addition to a couple of Laos salads, don’t miss out on the amazing sun dried, then fried and pounded pork that they offer here, and their house-made naem (soured pork), both of which are out of this world. The restaurant is located along the peaceful Kounxoua road on the back side of Wat Nong Sikhounmuang temple. South East Asia Travel Tip: If its really hot outside, don’t go too heavy on the sticky rice or you might want to take a nap. No matter where you are in the city, one of the top things to do in Luang Prabang is to enjoy the views of the Mekong or Nam Khan Rivers. The river breeze will always be cooler than that in the center of town, especially in the summer, so now would be a good time to sit beside one, take an afternoon break, and better yet, have a coffee in hand. Saffron Coffee not only serves an amazing cup of coffee, but you can feel both their people-first attitude, and of course a love for coffee, as soon as you step in the door. It’s without a doubt the best coffee shop, for the quality of coffee, in Luang Prabang. They have both indoor open-air and upstairs air-conditioned seating available, but the river-view seating across the street is just the spot for ultimate relaxation. Sitting by the the riverside gave us a great chance to reflect on the trip, chat with friends, and just enjoy a seriously good cup of coffee. Saffron is located very close to the Wat Xieng Tong temple and has a beautiful view of the MeKong River. A large Americano costs 20,000 Kip, and I actually can’t count how many I had during my trip to Luang Prabang. Warning: Eat your fill, or risk wanting to break airline rules regarding meat in carry-on baggage. 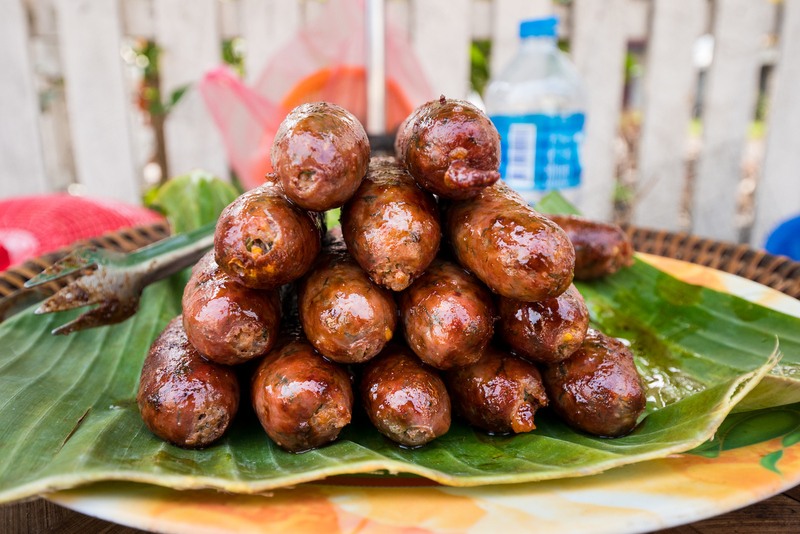 These sausages are one of the things you remember most when someone asks you, “So how was your trip to Laos?” I kid you not, this Luang Prabang sausage just might be the highlight of your trip. A big bite off one of these spicy, meaty, herb-packed grill treats might change the way that your mouth views food. 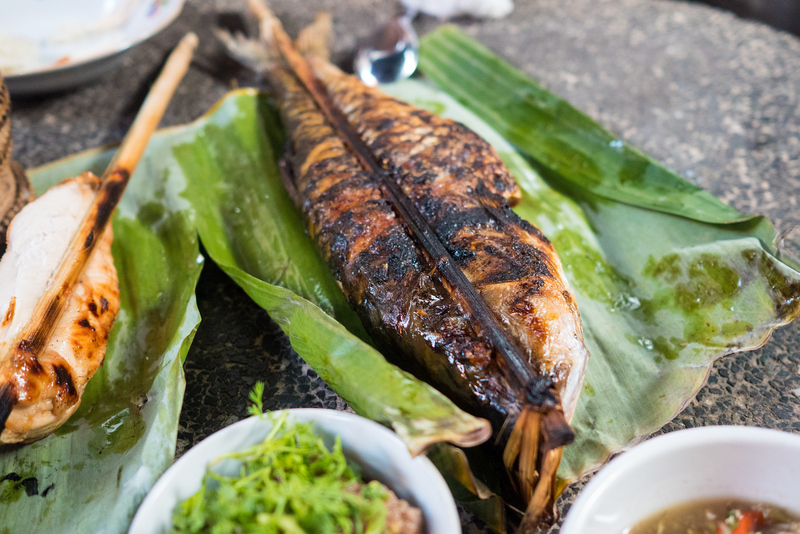 You’ll find sai oua usually grilled on the side of the road over charcoal. The best version we found was along Kounxoua (the middle road on the Luang Prabang peninsula) near to Wisdom Laos Guest House. We are serious when we emphasize that sai oua, is an attraction on its own in Luang Prabang, and it shouldn’t be taken lightly. By this time, perhaps after taking another stroll by the Mekong River, you’ll be ready to sit down for some more local Lao food for dinner. #1 Night Market – You could visit the evening street food market, where there are sure to be several great new dishes awaiting your discovery. You’ll find stalls selling Laotian curry dishes and rice, grilled fish and som tam, and vegetarian buffets that are one of the most budget (but greasy) options. Quality is variable. The evening market is on the street just beside the morning market, and it won’t be hard to find due to the fact that almost every traveler in the entire town will also be heading there every evening of every week. #2 Local Restaurant – However, our recommendation is that you take a quick stroll back towards Saffron coffee, continue on about 200 meters more towards the end of the peninsula, and let the chef at Xieng Thong Phonsavahn Restaurant knock your socks off with every single item on his menu. 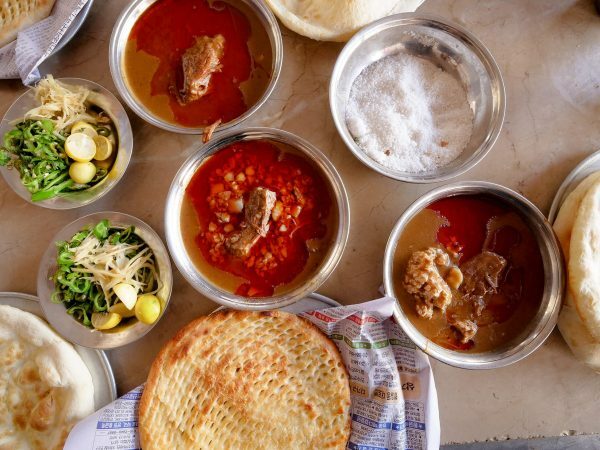 Tips on How To Order like a Local: Laos food is at its ultimate best when the dishes work to compliment each other. Make sure you order koi pa (similar to a perfect plate of laap), a fish salad, followed by something both creamy and rich. This restaurant does a masterful plate of a dish called jaew kee pa, it was even worth its own blog post. Be sure to eat some for me if you’re there, its made with fish eggs, fresh chili, roasted chili, dried chilies too, the rich umami-ness may leave you speechless! Finally, finish off the order with some type of spicy and sour soup, a tom pla would be great as this family uses fresh-caught Mekong fish. Don’t forget a kra-tip of kao neaw (basket of sticky rice), or maybe a dish of Luang Prabang’s own algae-plant kaipen to munch on while you wait. Every evening, the main Sisavangvong Road (which is the main road that runs through the historical peninsula of Luang Prabang) closes to motor vehicles, and a walking street market sets up. At the market you’ll find an abundance of all this Laos, especially souvenir type of things like baggy elephant print comfy pants, bracelets, and ethnic tribal shoulder bags. There’s so much available, and so many stalls you’ll be amazed – and plenty of vendors sell pretty much the same thing. Even if you’re not interested in shopping, the Luang Prabang night market is still a perfect place to take an evening stroll. Additionally, you can always grab a fruit shake at the front of the market. 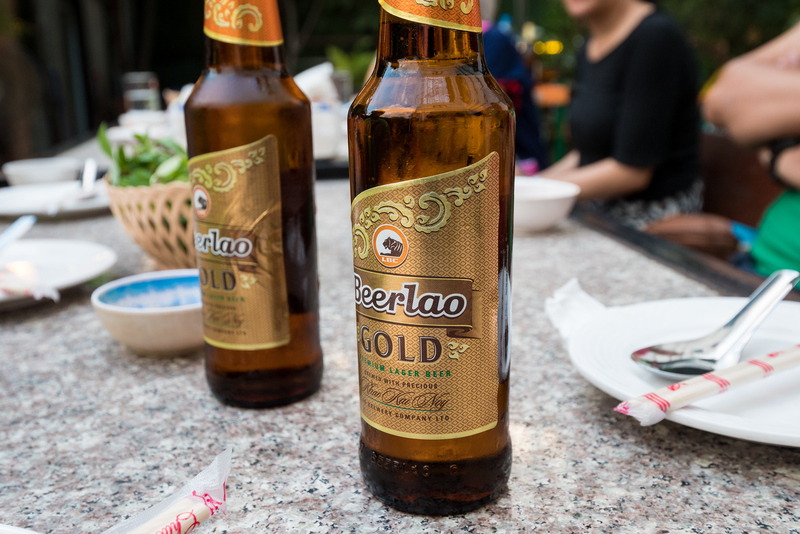 The Local Brew – BeerLao. A solid choice for any riverside evening. Now of course you could enjoy BeerLao before 8 pm, but if you haven’t already on this one day in Luang Prabang, now would be a great time to spend the rest of your evening just hanging out and enjoying the peacefulness of the city, and the amazing day you just had. Relaxing and slowing down your pace of life is one of the best things to do in Luang Prabang. On this map of Luang Prabang you’ll find all the attractions and restaurant listed within this top things to do in Luang Prabang guide. Reminder: The weather in Luang Prabang can change significantly from early morning to early afternoon, so you are going to want to have at least a long sleeve shirt in the morning, as well as shoes that you find comfortable. A hat and/or sunscreen would also be a good idea. Additional Info: There are many day trip and other things to do in Luang Prabang. In case you are interested in any of the few hundred signs advertising the Kuang Si Waterfall, the Pak Ou Caves, or non-riding Elephant Excursions – Each of these are half-day trips, and require spending several hours round-trip in either a 4-person tuk-tuk (50,000 kip each) or private air-con minivan (500,000 kip rental for the entire day). I hope you’ve enjoyed this do-it-yourself walking trip through a most wonderfully delicious and historically charming city in Laos. Let me know in the comments section below what you love most about Luang Prabang! 72 comments. I'd love to hear from you! 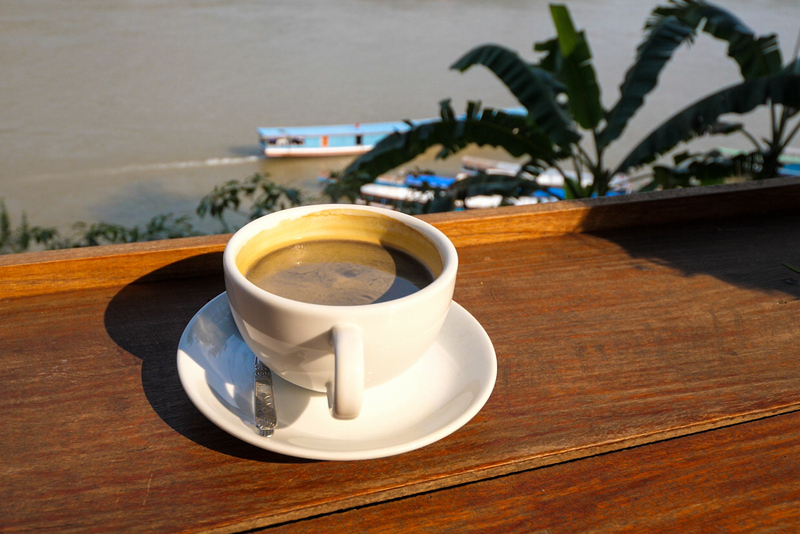 Coffee at Saffron watching the long-tail boats by the Mekong River is tops. One of my favorite Luang Prabang moments! Nice Post. Thanks for sharing a great post. I like it. Hi Fatima, thanks for your comments! Jitender, thanks for reading, and thanks for your support! Thanks for sharing nice information with us. I love it. You are very welcome, and I wish you a great day today as well! Nice articles thanks for sharing these to us. No problem Shivani, have a great day! Don’t forget a kra-tip of kao neaw (basket of sticky rice), or maybe a dish of Luang Prabang’s own algae-plant kaipen to munch on while you wait…. Have you had the Kai-Pen? Its such a perfect pre-dinner snack! Absolutely breath-taking photos…. What an amazing job you do capturing people in a natural element, bringing out the “sense of place”, and making us want to go where you’ve been. Morning freshy food experience! That’ll be great. Thanks for this information. Lots of food option. Thanks for sharing. So much time for food! This is an awesome itinerary! Great post Mark.I love reading to your blog, your photographs and everything is super amazing. Perfect Itinerary Mark:) You made my plans and travel easier. Keep going. it’s a really amazing post and your blog post is so interesting and I enjoy reading during your post because you have explained your post very deeply and clearly. Thanks for sharing such a great website with us. Such awesome photos, as usual. What kind of camera do you use? Hi mark the 1st time I’ve watch you’re blog was when your in tokyo i get so interested since me and my partner went to tokyo last year of May we’re going back this September.. and now I’ve been watching your blog every chance i got..your amazing and you have cute baby. I love this blog and design of this blog. When I read your posts, I feel positive. 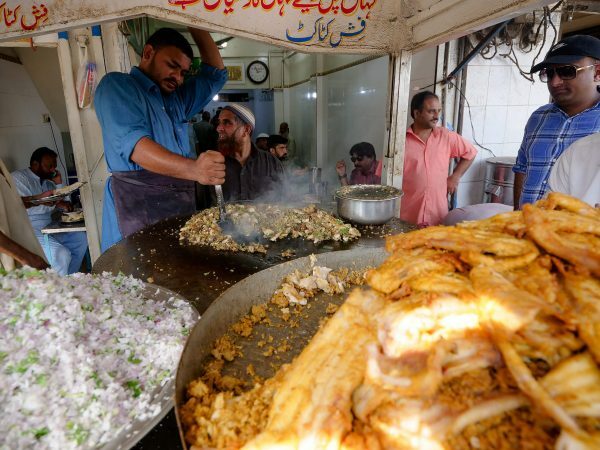 I never tried these food but looks amazing and yummy i hope when i will come i must try some of these. I have never been there but this post is amazing. Images are made this post more beautiful. A boy, who loves taking the road less traveled is drawn to new experiences and cultures, enjoys never ending conversation with the locals and feels a constant urge to explore the beautiful world. 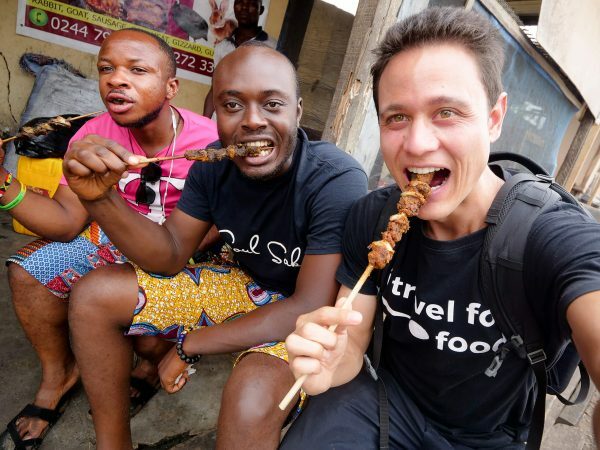 Traveling to the remote corners, meeting new people, sampling local delicacies, exploring different cultures and lifestyle has become my passion. I believe that every place has its unique mystical character and some awesome stories which are mostly unexplored and unheard. The urge of going to different places, experiencing something new and living a life that I have designed for myself has become an addiction. Getting lost in the map has become my favorite.Awesome content and tips for Luang Prabang Destination. Keep posting such content..
Thats beautiful, thank you very much for reading and for responding in such depth! I am also inspired by such things, thank you for the thoughtful comments. Yummy food really!. Thanks for sharing. Interested to try their food. I am especially curious with the grilled beehive! If no, may be you need to spend some time to go there specially go to Yogyakarta. You will find a lot of street food there, and i recommend that you try nasi kucing / “sego kucing” and wedang uwuh. I was in Vietnam recently and I really wanted ot add Luang Prabang to the itinerary but I simply couldn’t fit it in. In saying that I would have had to probably rush which is something I hate doing when I travel. I had no idea Luang Prabang is an UNESCO World Heritage City and htis makes all the difference to me. The preservation of the city’s authemticity is so important nowadays. Oh… and the food…… yum!! Thank you Amy! Yes, it is so worth the trip. This city is just the epitome of Peace. Great work on the blog. the topic you chose was something. I have been looking for in a long time. thanks for sharing your knowledge it really helped me a lot. Youre very welcome Sonali, thanks for writing! Thanks for sharing these all interesting things with us. Luang Prabang is exceptional for both its rich architectural and artistic heritage that reflects the fusion of Lao traditional urban architecture with that of the colonial era. Its remarkably well-preserved townscape reflects the alliance of these two distinct cultural traditions. Luang Prabang is one of my favorite cities. Great itinerary you’ve covered all the highlights in one day but I recommend people stay at least 3 days because there is so much to do. Interesting read and nice photos. I have never been to Laos. This land looks unique and beautiful. Hi admin, I went through your article and it’s totally awesome. I am searching for a blog about the food in the SEA, and my search ends with your blog. Keep on updating your blog with such awesome information. Waw! this is really amazing blog very entertaining, Thank you for sharing???????? great post dear, i will wait for your upcoming article in near future. Interesting post. Sounds good about your memories. and I would like to visit luang prabang. So could you suggest me that how can I visit under my budget? Hi Sonali, so this was not quite a ‘budget’ trip in 2018, but I have taken lower-budget visits to Luang Prabang, and Central and Southern Laos, several times before (2009 and 2011 I believe). I have the articles in the ‘Laos’ section, under the heading of Asia, accessible from the home page tabs. Hello Mark, I always read your blog very well. I’m surprised about your travel experiences. I wonder how you can find such delicious food, restaurants and wonderful places. If there is a tip associated with this, could you give me a little more information? I’m getting vicarious satisfaction from posting in your blogs. I want to live on a nice trip like you. It always cheers up by reading blogs. Thank you. Hey Bell, thank you very much. Oftentimes I reach out on social media to get recommendations, or I ask locals that I know living there. Then I also do some local research local blogs about food as well. And sometimes I just walk around and see what looks good! 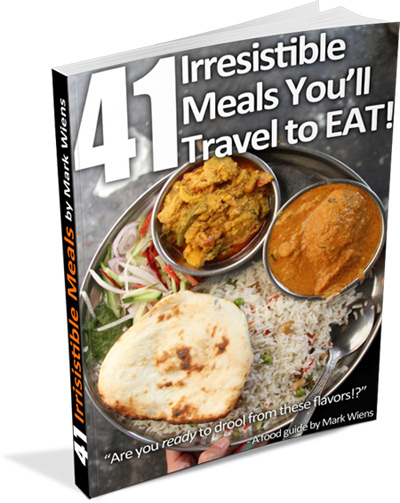 Mark – awesome recommendations. Just one small correction. Lao people called smashed papaya salad, tam mak hoong. som tam is the Thai word for it. We do refer to any smashed salad as tam som. Thank you very much Lala. it is a very cool place to visit but can you suggest how much amount carry to visit doluang prabang? Those passion fruit!!!! I love spicy Laos food!!! Loving every food blog and keep up the good work???? Keep it up Mark you are amazing and thank you for all the wonderful video. Thank you Keo, hope you’re doing well. Great Luang Prabang video and travel guide! I see that you have included drone footage in your recent videos – a nice addition – however, you don’t include your drone equipment in your gear description. Can you provide info on this? Thanks! Hey Bret, thank you very much. Yah that’s a great idea, I need to update my equipment list, but I’ve been using a Mavic Pro. Great video! I was there about 2 years ago with my mother and we actually did everything you did and ate at the same places except for the last place you went to. What a coincidence. It’s one of my favorite places in Laos. I love your pictures and videos. My 13 yr old actually introduced me to your page. Definitely recommend everyone check it out. It won’t disappoint. Hey Rosa, awesome to hear that. Glad you had such a good time visiting Luang Prabang as well! Great article, and brought back so many memories! I spent a week in LP several years back over Pii Mai (equivalent of Songkran) and had soo many memorable meals. In particular, there was a little restaurant whose name I can’t remember where you went down a steep flight of steps and sat on a deck overlooking the Mekong – it was a great place to enjoy the sunset and have a Beer Lao and some snacks, including sausage and fried river seaweed. Awesome to hear that, glad you have such great memories of Luang Prabang as well. What at amazing town, with delicious food! Hi Mark, I always enjoy your videos. I always wonder how can you eat so much and be so skinny. I am a big guy 6’2″ and 240 lbs but can’t eat as much as you. I love it when you show how they make the food. Keep on doing the amazing job that you do. Thank you very much Nasser. What a busy place it seems to be! Lively and colorful! Laos truly is a great country to visit! Great one Mark, really enjoyed it. Also the video was a lot of fun. That sun-dried pounded pork and the charcoal grilled Laos sausage looks so amazingly delicious. Can’t stop looking at the pictures. I will have to share this t my Twitter followers. Thanks for the great photos, Mark.